Multi-Stage Carb Blend (Glucose Polymers, Dextrose, Modcarb™ [Oat Bran, Amaranth, Quinoa, Buckwheat, Millet, Chia], Waxy Maize [Corn Starch], Cluster Dextrin), Natural and Artificial Flavors, Malic Acid, Dicalcium Phosphate, Calcium Silicate, Salt, Acesulfame-Potassium, Sucralose, Caramel Color. For Best Results:* For the first 7 days (loading stage): Take 2 scoops of CELL-TECH with 12 oz. (354mL) of water in the morning when you wake up and 2 scoops with 12 oz. (354mL) of water immediately after your workout. If you're not training that day, take 2 scoops with 12 oz. (354mL) of water in the morning when you wake up and 2 scoops with 12 oz. (354mL) of water later in the day. Maintenance stage: Take 2 scoops of CELL-TECH with 12 oz. (354mL) of water immediately following your workout. If you're not training that day, take 2 scoops with 12 oz. (354mL) of water in the morning when you wake up. For Better Results:* Take 2 scoops of CELL-TECH with 12 oz. (354mL) of water immediately following your workout. If you're not training that day, take 2 scoops in the morning when you wake up. Not intended for use by persons under 18. Do not use if pregnant or nursing. Consult a medical doctor if you have medical condition or before starting any diet or exercise program. As with all creatine products, maintain an adequate state of hydration during use. If you experience a skin rash or other allergic reaction, discontinue use and consult a medical doctor. KEEP OUT OF REACH OF CHILDREN. Multi-Stage Carb Blend (Glucose Polymers, Dextrose, Modcarb™ [Oat Bran, Amaranth, Quinoa, Buckwheat, Millet, Chia], Waxy Maize [Corn Starch], Cluster Dextrin), Natural and Artificial Flavors, Malic Acid, Dicalcium Phosphate, Calcium Silicate, Salt, Acesulfame-Potassium, Sucralose, FD&C Red No. 40. ...Just the Most Powerful Formulas Available. 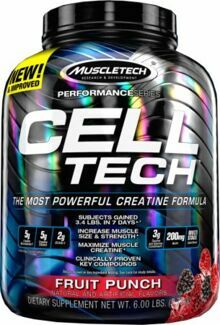 Each two-scoop serving of Cell-Tech delivers 7 grams of HPLC-certified creatine monohydrate and 3 grams of creatine HCl. Subjects who consumed the amount of creatine and carbohydrates supplied during the Cell-Tech loading stage saw substantial strength gains. Orange This is a Buy 1 Get 1 FREE offer!